Patient Zero, in a sturdy tank that’s just cracked open. It’s well-known that Night of the Living Dead is in the public domain because the last-minute title change accidentally removed the copyright notice from the distributed film. It’s less widely known that George A. Romero’s sequels dropped the word “living” from their titles due to the terms of splitting the remaining IP between Romero and co-writer John Russo. 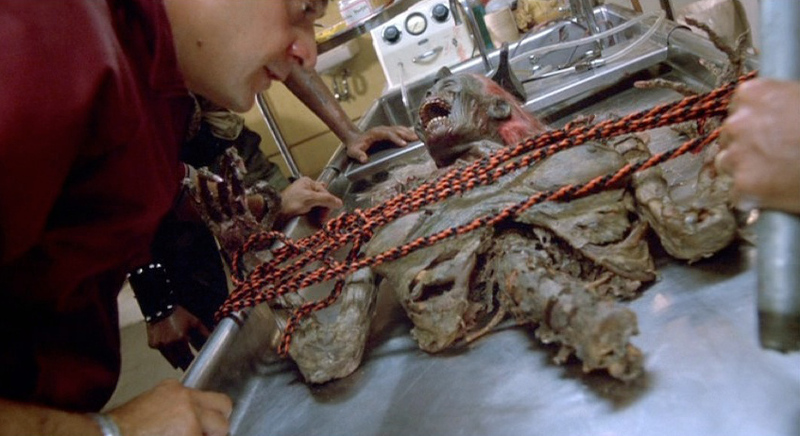 While Romero kept the rights to make official sequels, Russo kept the right to use the phrase “living dead”. It’s a deal that worked well for everyone. Romero, who’d had no attachment to the title their movie had been released under, could explore further dimensions of the setting. Russo could use the title to cash in on the fame of the original work. With a touch of luck, he made some money and launched a new franchise with another film that revolutionized zombies. 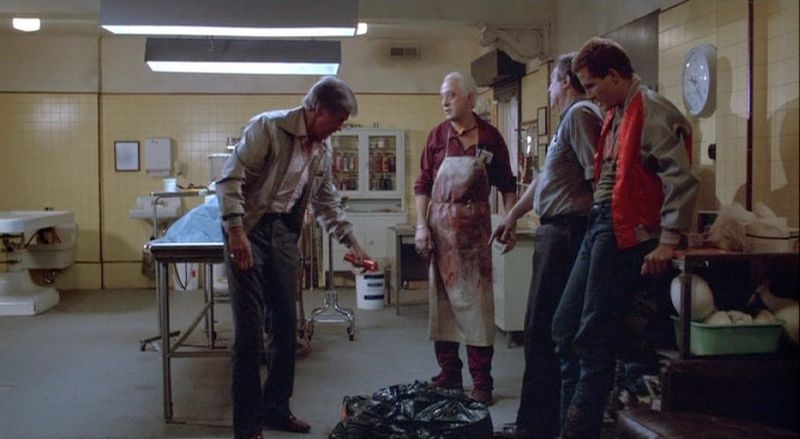 The luck took the form of Dan O’Bannon, whose reworked script and directorial vision made The Return of the Living Dead a horror classic in its own right, and a damn funny one at that. O’Bannon had previously contributed to another game-changing film, co-writing Alien with Ronald Shushet. He had collaborated with John Carpenter on Dark Star while in film school. With no credited directorial experience, it’s a wonder that O’Bannon was allowed to helm this project. Again, lucky for the resulting movie that he was. The placement of the handprint where Beverly Randolph can’t see it is a nice touch. The story is fairly simple. Workers in a medical supply warehouse mess with old canisters misrouted by the US Army. One of the containers cracks, letting out a toxic gas that brings the dead back to life. The warehouse is beside a cemetery, and before too long the entire area is awash in the living dead. But the story isn’t the whole picture. In fact, as an ensemble piece the story itself depends on which characters you’re following. Many horror films rely on a core group, who are whittled down as they separate. This one has two main groups, who intermix to an extent without ever fully blending. These are the staff of the supply warehouse (along with the embalmer who works nearby) and a group of punks who are friends with the newest employee at the warehouse. What’s brilliant about this is that it allows the veteran actors to anchor the film while including characters that appeal to a younger demographic. Clu Gulager just wants to dispose of some rabid weasels in the crematorium. Another smart move was using a punk soundtrack. It had only been a few years since Valley Girl had proven that a film fueled by new wave could move tickets and a single year since the cult film Repo Man used punk songs. It was by no means a safe decision to go with a playlist style of soundtrack at that time, at least not with one that wouldn’t appeal to nostalgic baby boomers a la The Big Chill . Yet it worked, partly because the songs added to the sarcastic tone of the movie, but also because clever selections and editing made the music serve as a score. To this day I can’t hear The Cramps’ “Surfin’ Dead” without envisioning survivors running every which way to broad up windows, and “Burn the Flames” by Roky Erickson makes an eerily somber accompaniment to self-immolation. The best idea kept from Night of the Living Dead is one of Romero’s recurring themes: every attempt to control the situation makes it worse. There’s a number printed on the canisters to notify the Army about their location. Burt, the owner of the warehouse, decided against calling it when the shipment arrived years ago, likely because of an aversion to getting involved in a bureaucratic snafu. Once the gas leaks, he again dismisses the notion of calling the number as it would lead to an investigation and possible criminal charges. He decides they can handle it themselves, and by “handle” he means “cover up”. So the evidence is taken to the mortuary for burning. Problem solved, except that the smoke has seeded clouds with the reanimation agent 2-4-5 Trioxin. This awakens the dead of the Resurrection Cemetery, creating a situation that spirals quickly out to f control as well-meaning paramedics and police provide more fuel for the fire. It’s all so avoidable, yet completely inevitable, that you have to laugh cynically. One businessman took out at least a large portion of Louisville, Kentucky, because he didn’t want to deal with red tape. Don Calfa interrogates a zombie. 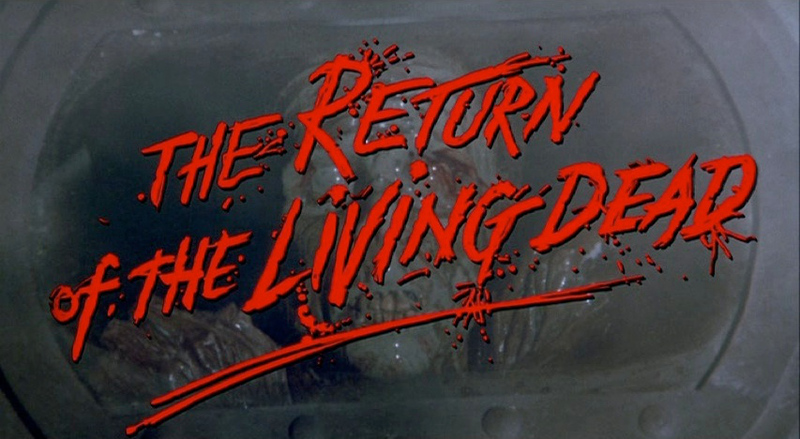 The Return of the Living Dead is credited with creating and/or popularizing a number of additions to film zombies. Unlike Romero’s undead ghouls, O’Bannon’s ate only brains. They could run, although the more intact corpses were better at it. They could speak, which is still fairly uncommon. The most unnerving part, though, is that they could feel. That’s their entire motivation. It hurts to be dead, and eating brains relieves their suffering for a time. To be consciously dead, aware of your body decaying, and knowing that there is no way to recover — it’s a nightmarish concept that is all too real for sufferers of terminal diseases. The greatest choice O’Bannon made was to make his zombies sympathetic. They are also victims in this film where the enemy is the failure of systems to incorporate human behavior.